Yes a late night post to welcome this years parties. Last year I was very sad to only get a few visitors from the party, but as I see my friends #UBP12 posts go up I decided I can’t miss out! I have been doing the party 3 years now! Welcome to Pepper Scraps I hope you will enjoy your stay! I recommend starting at my About Page where you can learn more about me and what you can find here at Pepper Scraps. 2012 is a big year for me as I have shifted gears in my life and have started to eat healthier, exercise, lose weight, and had weight loss surgery to help maintain my weight loss. I’m up to 75 pounds lost. With that change you will see a change in my blog as well as I talk more about food, share recipes, and share my struggles as I learn a new way of life. Yes I’m one of those bloggers. I blog about blogging, but I share more from the perspective of a mom blogger, a legacy blogger (blogging since 1998), and as a graphic designer. So if you are looking for someone to help you learn more about blogging and how to make your blog more appealing then this is the right place to be. Oh also I love vlogging, so if you like to watch vlogs then this is the place to be. I also encourage you to try vlogging, because it is awesome! Make sure and subscribe via RSS or via Email so you can get my latest and greatest ramblings! And because I hate those “hi I’m from the party” comments here is 5 questions for you to answer. You can either answer one or all five! When & why do you blog? What do you find most interesting about my blog: learning about blogging, learn about getting healthier or recipes? What is your favorite thing about the #UBP12? Wow, you lost 75 pounds?! That is simply amazing. I wish I can also be able to shed off my excess weight this year. Wow! Congrats on the 75 pounds lost! What a great accomplishment! What is your favorite color? Favorite color is RED! When & why do you blog? 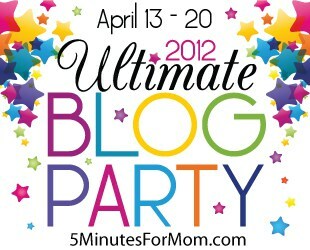 I blog either early in the morning or once my oldest is at school and the other is down for his nap! What do you find most interesting about my blog: learning about blogging, learn about getting healthier or recipes? I have always been into recipes, so I will be definitely be back to check those out! And after I have this baby I will be looking into losing all the baby weight and getting into a shape other than round! What is your biggest goal this year? to have a healthy baby! 🙂 Other than that, to get caught up on my scrapbooking before the end of the year! What is your favorite thing about the #UBP12? This is my first year, But I have already “met” so many people and have been introduced to many sites! That is pretty fantastic! Okay…color (I can be a bit bipolar here) today it’s blue. When and why I blog- daily. I have 2 blogs for many reasons I guess.I like your reasons for blogging. My biggest goal- could be to lose a bit of weight. Favorite thing for me is always meeting new bloggers. congrats on the weight loss! i am most interested in that info! Wow, Congratulation! You lost 75 pounds,that´s simply amazing and impressing! Blog: I blog with my sister and we try to blog every day. Biggest goal: This year I’m working on being intentional with my time and family. I’m glad you like my recipes, I hesitate to share them sometimes, because that is def not where my blog started, but it’s a new chapter in my life. My favourite colour is Orange as nothing rhymes with the word and its a tasty fruit! Hi Bianca – I’m sure you will meet some great friends via UBP I have in the past! I have written about where to find good images for blogging, but not how to take good images for your blog. I will have to add that to my to do list. I’ve been here before due to the awesome Comment Hour, but figured I would say hi again! When & why do you blog? I use to blog 5+ days a week, but now I’m lucky if I blog 3 times a week. No longer having a job that allows me to spend 6 hours a day online has slowed my blogging tremendously. I started blogging as a way to keep a baby book for my son and now I blog to reach out to friends and make new ones. What do you find most interesting about my blog: learning about blogging, learn about getting healthier or recipes? I enjoy learning about blogging and I also like reading about other people’s weight loss journeys / improving their health. Well, my favorite colors come from natural dyes, we will have a lot of woad this year, so this year I am assuming that my favorite color will be blue. Next year, who knows?! My biggest goal this year is to make more money than we are making now. I blog about 3-4 times a week and I let my husband post something too, when he is not writing poems or working in the garden. Come visit our party in Hungary – in a few hours our video will be up….6 hour upload for a simple slideshow – good old farm connection! Wow, it sounds like you are living an interesting life! Thanks for stopping by! First and foremost…congratulations on the 75 lbs. What an inspiration. Definitely will be following your blog. I am glad you chose to join the UBP12 this year or I would have never met your part of the blog world. I definitely look forward to reading your blog. Thanks! It was really hard work to lose the 75 lbs and trying to keep losing is even harder, but everyday I just keep trying. I hope that you enjoy my blog! Wow, blogging since 98? Love it! You must have tons of great ideas about how to keep blogging interesting and fresh. To answer one of your questions… sometimes I think I blog for my own amusement. I guess if I really had to pinpoint why I do it, it’s to keep writing. I used to be a newspaper reporter and now I’m in public relations — I still write for my job but not as much as when you’re banging out 2 stories a day. So the blog forces me to write regularly, which is important to me. Found you on the UBP. Glad I did. Congrats on losing 75lbs that’s quite an accomplishment! I just wanted to stop in and say thank you for the great recipes I am definitely going to have to try some especially the Antipasto Frittata. YUM! Pepper, thanks so much for visiting my blog through #UBP12. I’m really excited to take a look around your blog! My husband and I are starting to try and lose weight, so this will be great. I’m excited to read your posts about the different restaurants.